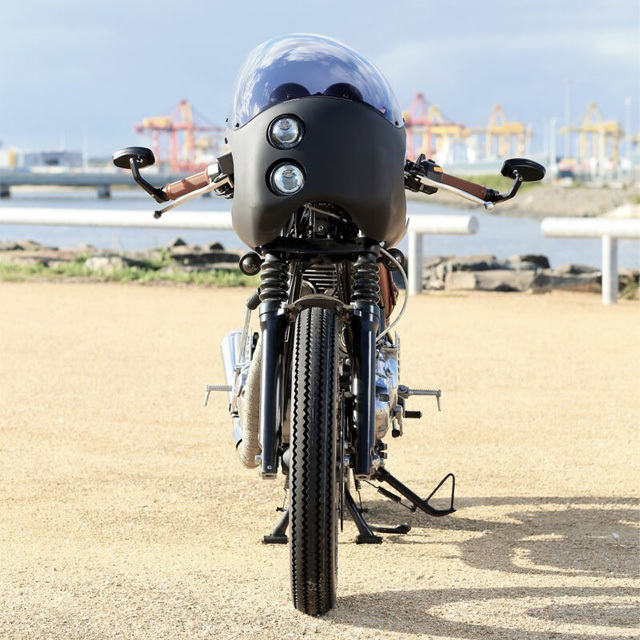 Rewind MC have been running a motorcycle hire service outside of Wollongong for the last two years. 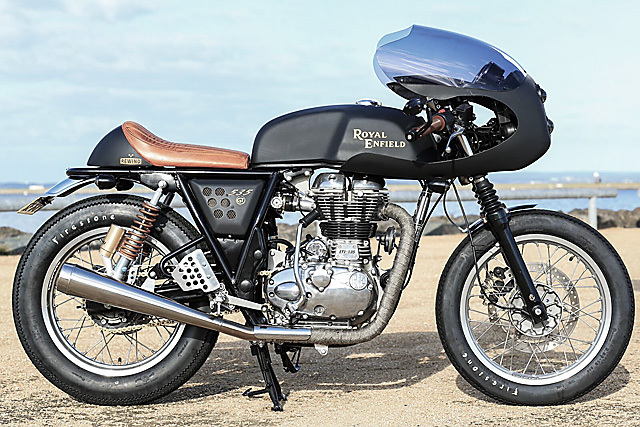 For a sensible amount of money you can hire Royal Enfield and thump your way around the gorgeous coastal roads south of Sydney. 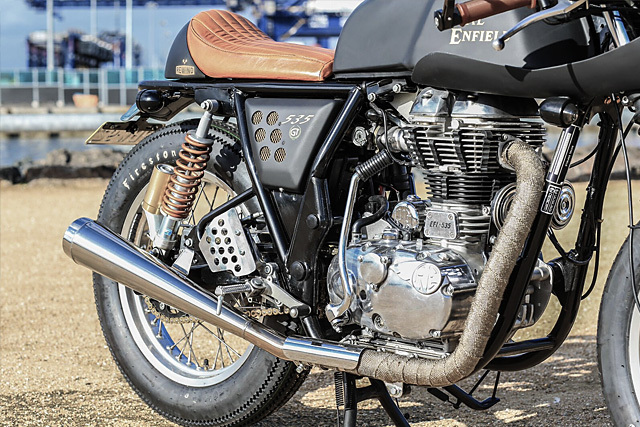 You get the sensory beauty of riding one of the most characterful bikes around some of the world’s best roads before parking it back at their shop, leaving the spanner turning, oil-leak plugging and loud cursing inherent with Enfield ownership to Mark Mleczko and his team. 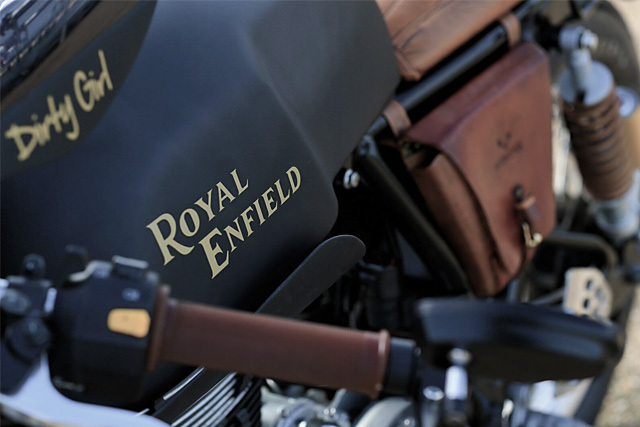 I think it’s a genius of a business, because in my experience, Royal Enfields are beautifully fickle things better hired than lived with – much like boats, aeroplanes and redheads. If it was a hack job, I’d say that he would have upset a few people. But what follows is some of the most beautiful, restrained custom work I’ve seen in a long time. And all done in-house, with the team finding most aftermarket parts for the Enfield of questionable quality. Central to Dirty Girl’s appearance is her aged, brown leather seat and tool bag. “I wanted an old-school look, so went with old school leather,” Mark says. “My leather craft skills learnt 40 years ago in scouts were tested big time.” He must have had a different scouting experience from me, as most of my time in scouts was spent shivering under tents or avoiding the unwanted advances of Baloo. After a couple of attempts Mark made a tool pouch that perfectly replaced the right hand side cover. The seat was recovered with the same material, with stitching running front to back to emphasize the long lines of the bike. 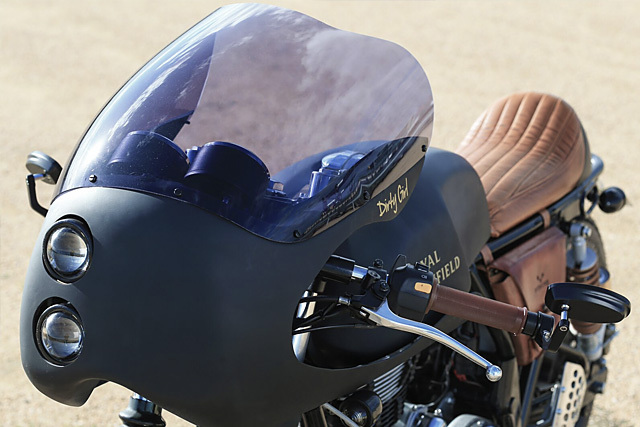 The leather was distressed before Rewind MC turned their attention to the matte finish on the bike, which they also completed themselves. “Paint was also done in the shed with matte black all over, gold GT stripe and some checkers down the middle. Then it was distressed to give it that ridden-all-the-time feel. To finish, matte clear coat went over the lot. We mounted Firestones and fork gators to finish her off.” Well, if the offset twin headlight mount doesn’t annoy the purists, a pair of Firestones will surely give them the casus belli they may be looking for. The result of all these modifications is a bike that’s more worthy of the GT title than the original. “With the clip-ons now under the triple clamp and the rear stance about 40mm higher, she has a proper sportbike-like reach across the tank and turns in just that little bit quicker.” chuckles Mark. “Stability at speed has not been affected with the changes. With a more aggressive stance and sound, she feels like an old school café racer.” And it’ll continue to improve too, with the Dirty Girl’s single cylinder engine loosening up nicely during the break in period, all while the Motad exhaust beats out a steady rhythm. 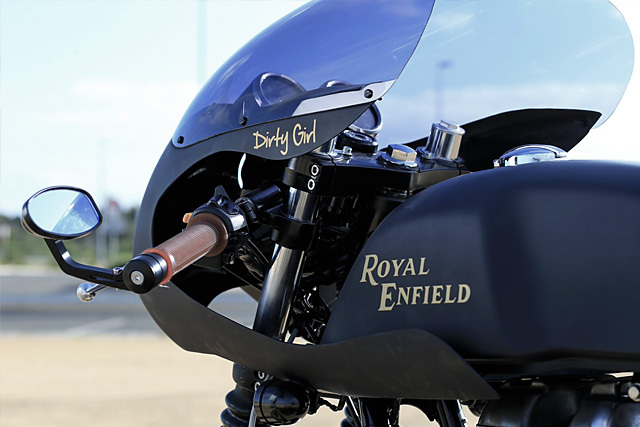 Rewind MC’s Dirty Girl is, in my opinion, the bike that should have been released by Royal Enfield in the first place. 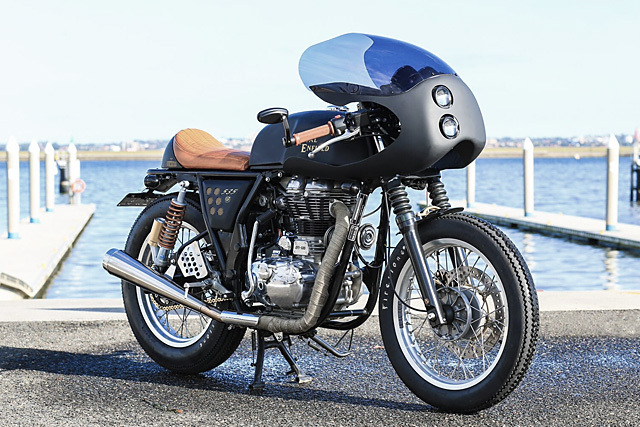 It’s the perfect mix of a classic looking single, updated with a modern fairing that’s finished in a subdued paint scheme that nods, rather than screams and shouts, to its lineage. It’s my favourite kind of build, with some nice individual features not distracting from lines so well-considered and thought out it could be mistaken for a stock bike. 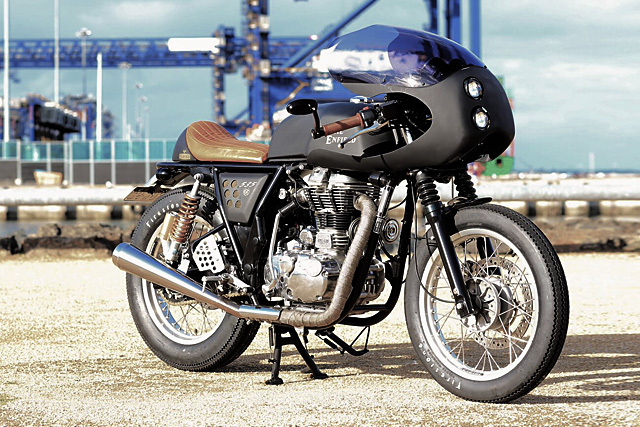 For me, that’s the real art in building a custom motorcycle.